Every civilisation has left its mark on nature, each one according to its own cultural parameters and within the limits imposed by climate and biological diversity. The resulting landscapes – parks, gardens, botanic gardens, orchards and farmland – have in turn shaped the personality of the people living in them, their lifestyles and the way they relate to their surroundings, becoming part of their cultural identity. Landscapes are living, changing and changeable organisms that are not subject to specific, formal and organisational parameters as urban areas usually are. This is particularly important for Islamic civilisation, which was able to combine aesthetics with science through the study and contemplation of nature. 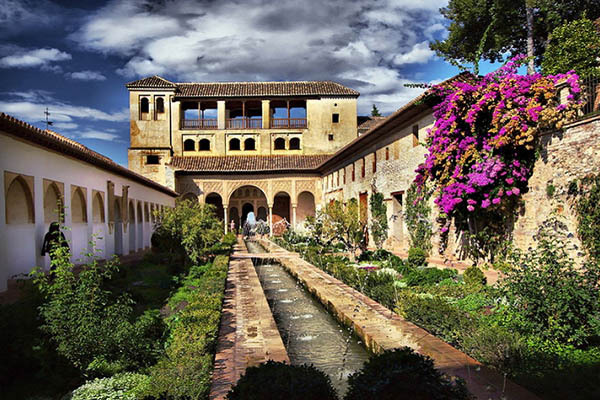 As part of the programme entitled “MED-O-MED Cultural Landscapes of the Mediterranean and the Middle East”, FUNCI chose the Al-Andalús garden and landscape in particular, and Islamic gardens in general, as a powerful symbol that combines several concepts – a coming-together of different cultures, scientific development, spirituality, coexistence and wellbeing. The garden as a symbol of peace and tranquility, a place in which all human beings without exception are happy to be, a place for reflection and quiet but also for scientific development. A traditional space to be used, respecting biodiversity and responsibly managing and distributing natural resources such as water. Over the centuries, Islamic civilisation has shown a marked interest in nature, based on the Koranic principles that encourage the contemplation of nature for the purpose of reflection. According to Islamic tradition, nature was created as a source of spiritual inspiration and of sustenance. But this does not entitle human beings to exploit it or dominate it indiscriminately, just to administer, and enjoy it. Nature is sometimes at the service of human beings but must not be subjected by them. “He it is who sends down water from the cloud for you; it gives drink, and by it grow the trees upon which you pasture.He causes to grow for you thereby herbage, and the olives, and the palm trees, and the grapes, and all the fruits”. This entry was posted in Botanic Gardens and tagged botanic garden, jardín botánico, Landscapes, Medo-O-Med, paisajes culturales.